The interior and exterior painting of your home is a major improvement that requires thought and planning even when you hire our commercial painting company to do the actual work. You want to pick appropriate colors that will enhance the appearance of your house in the neighborhood, and you want to make the interior as attractive and modern as possible. Choose the same neutral color, such as white or beige, in the main open areas. Don’t use intense or dark colors that will present a future problem. However, in bedrooms, muted greens, blues and yellows are excellent and up-to-date choices. If you want to brighten a dark room, use a lighter color. However, if you want to be dramatic and add warmth and elegance, you can be brave and use a rich dark color. White is the safest choice. It is bright and makes the ceiling look higher. Add a few drops of the wall color to the ceiling paint to tint the white enough for a good transition. Perhaps use a color wheel. Blue based hues are on one side and yellow based hues are on the opposite side. They progressively shade as you go around the wheel. There is a huge difference in the skill level, ability, knowledge, quality and professionalism of painters. Call our helpful and knowledgeable staff and do an interview by phone first. 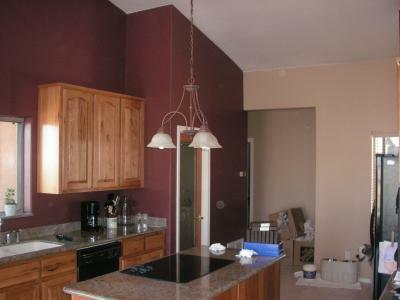 Invite our competent painters to come for an on-site estimate. Ask to speak to a few of our prior customers for excellent referrals. Tempe, AZ Interior and exterior painting will greatly improve the marketability of your home if you are considering selling it. It will sell much quicker with a fresh coat of paint that will make the house sparkle!